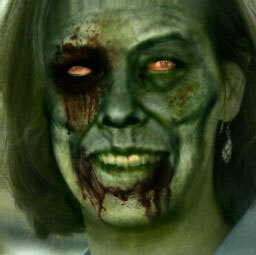 Suzanne Kantra Turned into Zombie? Suzanne Kantra, consumer technology guru and founder of Techlicious.com, has been turned into a zombie, according to family and friends. And a recent photo of Suzanne shows her with the tell-tale pallid green skin, bloodshot eyes and seeping wounds typical of zombification. Josh Kirschner, co-founder of Techlicious, refused to confirm or deny Suzanne's transformation, but suggested something may be amiss. "We had an incident a couple of weeks ago where Suzanne tried to eat one of our editors," said Kirschner. "We suggested she take some time off to spend with her family." Yet few in the tech world seem to have noticed. A representative from a major electronics company, who did not want to be named for this article, saw Suzanne at a recent press conference. "Suzanne looked green around the gills and smelled a little funky, but no more so than most of the tech journalists I deal with," she said. We asked Dr. Vlad Stipovich, an expert in zombies, ghosts and ghouls, and frequent guest on the talk show circuit, for his opinion. "Based purely on the photo you're showing me, this does not look like true zombification," said Dr. Stipovich. "I suspect that this may be a doctored photo that was created using the Make Me Zombie website." Visiting the Make Me Zombie site reveals photos of others with characteristics very similar to Suzanne's. However, it is impossible to say for sure whether these are also doctored photos or there are, in fact, many more zombies roaming our streets. We attempted to contact Suzanne by phone to confirm whether she was still among the living. However, the person who answered her phone revealed nothing more than grunts and guttural moans.